Land-use planning – the authority to regulate the development and use of land to advance the health, safety and welfare of the public – has long been recognized as a tool for natural hazard mitigation and climate change adaptation. Gilbert White and Eugene Haas, in Assessment of Research on Natural Hazards (1975), pointed to the vast potential for local land-use controls in regulating development in hazardous areas. Foundational studies that shape our current approach to disaster management, like Dennis Mileti’s Disasters by Design, also recognize the central importance of land-use planning in reducing disaster losses. And yet, land-use planning has been largely absent from the U.S. emergency management policies and programs. Even hazard mitigation plans – one of the best policy vehicles we have for advancing local disaster risk reduction efforts – drastically underutilize land-use planning. There are likely several reasons for this. First and most obvious is the common ceding of land-use authority to local governments, meaning we have a patchwork of tens-of-thousands of land-use authorities with different needs, resources, and political considerations. Using land-use planning as a tool for hazard mitigation also requires a background and knowledge set that have not been particularly common in the emergency management community, which has historically been dominated by professionals from the military, police, fire and emergency medical services professions (aka the “lights and sirens” crowd). The messy local politics of land-use planning is often a poor fit for their experiences and strengths. Third, emergency managers and planners historically have had few institutional incentives to collaborate and speak different professional languages, common issues with the “siloing” of expertise. Lastly, federal policies and programs can actually thwart efforts to use land-use planning to reduce risk. Raymond Burby and his colleagues (1999), for instance, describe how local land-use planning is routinely undermined by federal programs that incentivize, protect, or even encourage development in hazardous places. This is all changing. In recent years, planners and emergency managers have increasingly acknowledged their shared goals and interests. The emergency management profession has begun to diversify, and increasing numbers of emergency managers have training in planning, public administration, and other land-use related fields. FEMA has funded and made available a terrific set of resources on land-use planning, from Integrating Hazard Mitigation Into Local Planning to Phil Berke’s prep talk on Land-Use Planning for Community Resilience. Likewise, the American Planning Association has published several important guides on planning for natural hazards, like the recent PAS reports Planning the Wildland-Urban Interface and Subdivision Design and Flood Hazard Areas. Across all these resources, we are seeing an increasing convergence between hazard mitigation and land-use planning, to the benefit of both. This is difficult work, however. 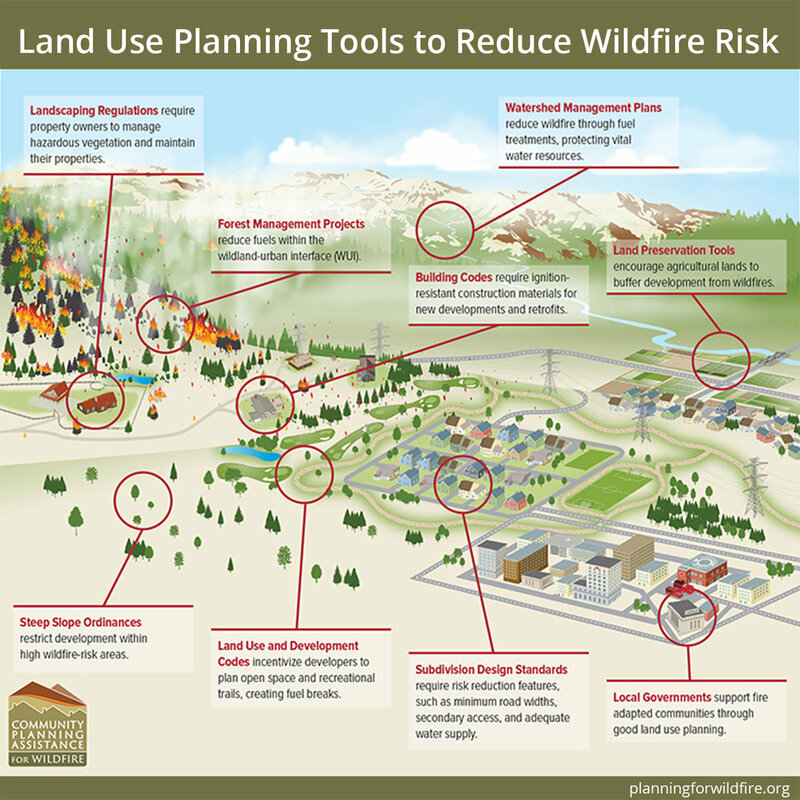 Leveraging land-use planning for hazard mitigation requires significant time, information, money, political commitment, and community buy-in. These are resources in short-supply in many communities, especially given the myriad of other important issues we need to plan for. Since we launched the Planning for Hazards project in 2016, we have learned some important lessons. First and foremost, knowledge about land-use planning and hazards is necessary, but not sufficient, to spur action. While we believe our guide if fairly unique, it is only information. The Department of Local Affairs and CU Denver, among other partners, have tried to help communities move from “knowledge to action” through a variety of projects that use the guide as a jumping off point. These included a two-year webinar series on land-use planning for natural hazards; interviews with local leaders who have “walked the walk” of hazards planning; a year-long implementation project with three communities in Colorado who revised their land-use tools to better mitigate risk; and the Mitigating Hazards Through Land-Use workshop that helps local governments to kick off their land-use planning process with expert consultation and peer-to-peer learning. All of the materials from these activities are free and available on the Planning for Hazards site. Second, the project has taught us how important collaboration is for achieving action, especially in smaller communities and those with fewer planning resources. Planning for hazards, especially for hazards beyond floods, requires a great deal of resources that are often beyond the capacity of communities. Finding the right mix of resources and incentives that will spur communities to act is still a challenge. We hope this project might inspire similar projects in other states. In fact, much of the work is already done! For many states it would be a short step to modify our guide to match their own communities needs and interests. We would be more than happy to share whatever material we have. The Natural Hazards Center recently wrote a story about the project, which highlights the implementation aspects of the project. The Western Planning also wrote a nice summary of the project in 2018. If you happen to be at the Natural Hazards Workshop this year, I will be moderating a panel where project participants will discuss their experiences. The Planning for Hazards project was conceived and led by the Colorado Department of Local Affairs. Clarion Associates, along with DOLA, the University of Colorado and a great group of consultants, created the guide. Today, I help to manage the project along with DOLA and a steering committee of hazard mitigation and land-use planning experts from organizations like FEMA, the Colorado Water Conservation Board, the Department of Homeland Security and Emergency Management, the Natural Hazards Center, and the town of Manitou Springs. The curriculum vitae, or CV, is one of the most important components of your academic job application. It is the document that most search committee members will read first, before they (hopefully) dive into your cover letter, research/teaching/diversity statements, and writing sample. It is an outline of your record, a shorthand of your accomplishments. Your CV will evolve with you throughout your academic career. It is a highly individual document that you also share with the world. 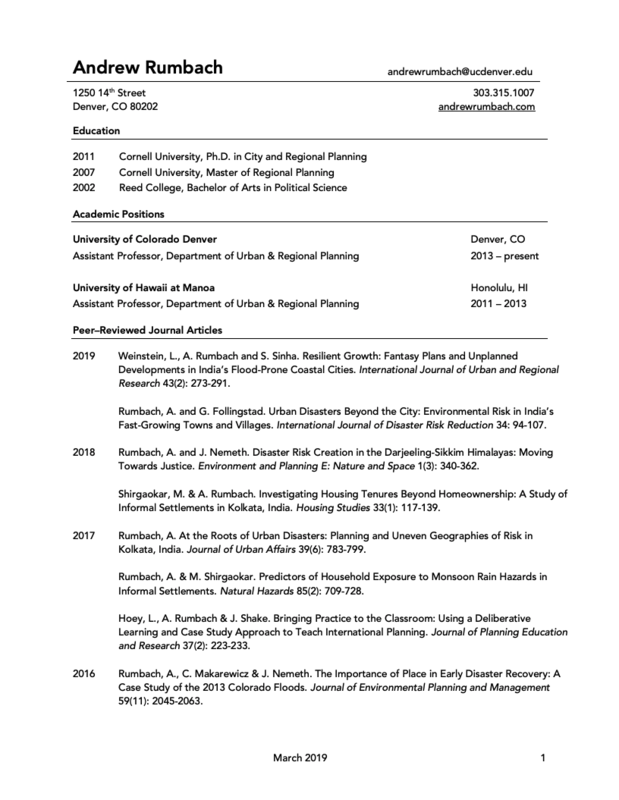 Every academic planner has a CV, and thus every academic planner has an opinion on how a CV should be written. There are no hard-and-fast rules. And yet, the CV is a place where norms and standards are performed for search committees. A CV that doesn’t conform to certain unwritten expectations may signal to committee members that this candidate is not ready. The goal of this blog post is to describe the contents of an effective CV, and some of the norms and standards that you are expected to follow. Hopefully this advice will allow your CV do the work you want it to do; i.e. provide a succinct account of your accomplishments in a format that is legible across our discipline and the academy. Please note, this advice is specific to the United States academic job market. The norms and standards of CVs will likely vary in other places. In this section I describe the components of a CV in (roughly) the order they should appear. For reference, here are my CVs from my first time on the job market, second time on the job market, and in my current position. I don’t hold these up as models. In fact, I see a lot of mistakes on my job market CVs that I wish I could go back and correct. Alas. Personal information: Your name, institutional mailing address, email address, phone number and website address (if applicable) should appear at the top of your CV. Do not include a photograph or any additional personal information like gender, birthdate, hobbies or marital status. Education: You should then describe your educational background, starting with your PhD and through your undergraduate degree. If you are a current PhD candidate, you might indicate the date when you expect to receive your degree. Some candidates include the names of their dissertation committee members. I don’t personally do this, but think it is fine to do. Don’t include information like your GPA or membership in honor societies. Academic positions: Next, list any academic positions you have held here. Make sure to be specific. So, for example, in my second job market CV I described my appointment as a visiting lecturer at Cornell as well as my Assistant Professor position at the University of Hawaii. Be sure to include dates and the department(s) or unit(s) within which you worked. Professional experience: Most academic CVs will not feature professional experience. Urban and regional planning is a professional field, however, so it may be beneficial to list your relevant work experience outside of academia. You will need to use your best judgement on whether to list your professional experience, and be sure to only include substantial work that is directly relevant to your research, teaching, and/or service. If you have 10 years of experience working in a professional planning setting, for example, that is certainly worth including and will likely be viewed as an asset by many search committees. If you have a year of experience or a summer internship, however, I would not include them. Research: The next section of your CV should describe your research accomplishments, most importantly your a) publications b) grants and c) presentations. Do include a full citation for each publication. Don’t mix publications together. Peer-reviewed journal articles should be separately listed from book chapters, which should be separately listed from book reviews, encyclopedia entries, opinion pieces, etc. Don’t force the search committee to parse your publications! There is a clear hierarchy with regards to the categories of publications in planning and academia generally, and this section of your CV should reflect that. Do list your manuscripts under review. For your job market CV (i.e. the one you send to search committees), list the journal where a paper is under review regardless of its status (submitted, under review, revise and resubmit, or accepted pending minor revisions). For your public-facing CV, don’t list the journal unless you have already received a revise and resubmit decision. Do/Don’t include a ‘manuscripts in preparation’ section. After all these years, I still don’t know what to think about this common CV entry. On the one hand, describing your future papers can signal to a search committee that you have a well-thought out publication plan. On the other, anyone can describe all the great things they intend to do in the future without including any actual information about the present. My advice: be sparing. If you decide to include papers in preparation, limit the number and don’t describe the journals where you intend to submit them. Do try and associate them with an accomplishment (i.e. presented at the 2019 ACSP conference, manuscript currently being revised for submission). Don’t be the person who has 12 manuscripts under preparation but none actually published - this sends the wrong signals. Grants: The next part of the research portion of your CV should describe your competitive grants. This means grant funding you have received separate from your standard university stipend/package. I separate internal/external grants, but as a PhD candidate you can probably combine them. What grants should you include? Those where you are the principal investigator (PI), co-principal investigator (co-PI), or investigator i.e. grants you had a part in receiving and administering. If you were hired onto a grant project as a PhD student, you probably shouldn’t include the grant on your CV. Do include the competitive academic fellowships you have received. Presentations and workshops: Next, describe your research presentations and/or workshops. As a PhD student these will mostly be conference presentations. Include the paper or talk title, date, and conference/workshop/proceeding. You might also include a section on invited talks. There are too many individual circumstances to discuss here, but if someone sought you out to present your research based on your record or reputation, it is generally considered invited. If you sought out an opportunity to present your research (e.g. submitted a conference abstract) then it is not considered invited. Be cautious about what you include in this section, generally - there is a line between “accomplishment” and “padding” that you don’t want to cross. You prepared a 45-minute research presentation for an on-campus lecture series? Absolutely include it on your CV. Delivered an informal presentation about your research to friends over beers? Don’t. Urban Sustainability is a graduate-level course on the fundamentals of environmental planning and sustainable development. I was the instructor of record from 2013-2019, during which time I delivered 12 sections of Urban Sustainability. Global Cities is an undergraduate course that introduces students to the histories and theories of urbanization outside of the United States. I was a graduate teaching assistant for Global Cities in 2009 and 2010. During that time I led my own discussion section, graded student papers, delivered a once-per-semester guest lecture, and assisted the instructor of record with other teaching-related tasks. Notice that I clearly describe and differentiate my teaching responsibilities in these short descriptions rather than simply listing the course titles and years. If you have any specialized training on pedagogy, you should also include it in the teaching section. Service: In this section you should describe your service activities, whether to your university (committees, student leadership), the profession (e.g. academic peer reviewer, regional/national leadership), or the community. Awards and honors: Finally, you should list any awards or honors you have received. The lines get a little blurry here…for example, a Fulbright-Hays fellowship is both a grant and an award. You will need to use your best judgement, but if you have received an award or honor for your research, teaching or service, you should make sure it has a home in your CV. How should I design my CV? After content, you should also think about form. What font should you use? What size? How large should the margins be? These are all important questions, but not ones you should obsess over. If your CV includes the information described above and generally follows the conventions of the field, the form will matter less than the substance. Try and follow the basic rules of design. Pick a font and font size that is clear and professional (Arial = yes, Papyrus = no). Choose margins that are not too small and not too big. Space your sections a bit, but don’t include excessive white space. And so on. When in doubt, pick a few CVs that look great to you and mimic their design, or find the standard CV template for your university and use that. If you are hopelessly lost, ask one of your design-oriented friends to take a look. If they don’t recoil in horror, you are probably ok.
As you can see, my CV has evolved significantly since I was a first-time job market candidate. It still provides a summary of my work and accomplishments, but serves a slightly different purpose today than it did then. Most importantly, I have begun to curate the contents for the sake of brevity. I am not “on the market” these days and don’t need to paint a complete picture of my work. If I were on the market, I would provide more detail in the teaching, peer-reviewed conferences and invited talks sections. This is all a way of saying that you shouldn’t necessarily mimic the CVs of professors in your department, particularly ones who have been around for years or decades. You will probably be better served by asking to see the CVs of the recently appointed faculty, or those who have recently been successful on the job market. If you are a faculty member reading this blog and have a good CV you are willing to share, please send me a message and I will post it. Last point - and I can’t stress this enough - get together with your peers and critique each others CVs. Your personal tastes and preferences will vary, but you should seek out feedback in a low stakes and supportive environment. Print some paper copies, get some red pens, and order a pizza. Invite some junior faculty. It will pay off handsomely. The CV is a deceptive document. It is simple in its form, yet does a lot of spoken and unspoken work. When in doubt, remember to make your CV is organized and only includes the essentials. It is ok if your CV is short! In fact, the search committee probably expects it. Much better to communicate a brief record of solid accomplishment than to muddy the waters with padding and fluff. Others? Please share them and I will post here. Land acquisition (or property “buyouts”) has become a key tool in hazard mitigation and resilience planning. At a basic level, land acquisition programs aim to reduce disaster risk by removing development from hazard exposed land and protecting it from future development. These properties are typically returned to a natural state and sometime used for low-intensity recreational uses like bike paths or parks. In Colorado, for instance, jurisdictions have established land acquisition programs with the intention of establishing public control over ‘repetitive loss’ properties and other properties that are highly exposed to natural hazards. FEMA (through the 404 program) and HUD (through Community Development Block Grant Disaster Recovery (CDBG-DR) grants) both fund voluntarily property acquisition programs, and have spent billions of dollars over the past couple of decades in places like Houston and New York. These programs raise important equity concerns. A whole lot of communities with low-incomes and affordable housing are located on hazardous land, especially floodplains, for reasons of historical racism and the dynamics of private property markets. When we purchase affordable housing to protect future populations from disasters, we might be trading one type of vulnerability for another. Are the households being “bought out” able to afford to stay in their communities and keep their social networks intact? Are they able to afford housing that is less exposed to hazards? When we take affordable housing out of the system, are we replacing it elsewhere to avoid cost escalations for households with low-incomes, generally? 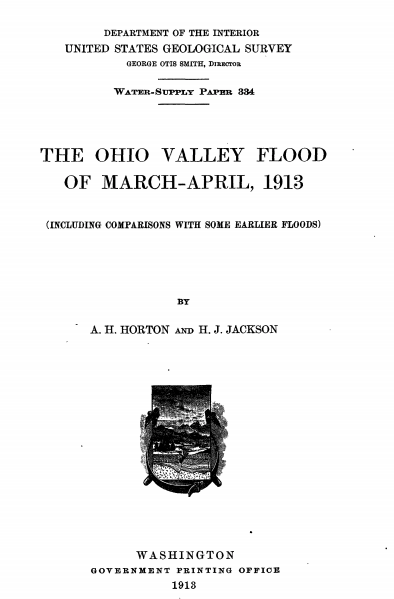 As this report shows, the idea of property acquisition for hazard mitigation has been around a long time, as have the equity concerns that accompany them. The report also makes you shake your head a bit. After 106 years, have we really only come this far? (if that question interests you, highly recommend the Greer and Binder piece linked below). Binder, S.B. and Greer, A. (2016). The devil is in the details: Linking home buyout policy, practice and experience after Hurricane Sandy. Politics and Governance. Gotham, K.F. (2014). Reinforcing Inequalities: The Impact of the CDBG Program on Post-Katrina Rebuilding. Housing Policy Debate. Greer, A. and Binder, S.B. (2017). A Historical Assessment of Home Buyout Policy: Are We Learning or Just Failing? Housing Policy Debate. New Research: "Resilient Growth - Fantasy Plans and Unplanned Developments in India's Flood-Prone Coastal Cities"
In the face of rising seas and rapid growth, coastal cities in India have taken up the mantle of “resilience” in glossy climate action plans, high-profile international partnerships, and voluminous disaster management documents. And yet, while resilience has firmly entered the Indian city planning lexicon, environmentally destructive urban development continues largely unabated. What explains this seeming disconnect between the transformational goals of resilience planning and the everyday practices of urban development? In a new article just published in the International Journal of Urban and Regional Research, Liza Weinstein, Saumitra Sinha and I examine the contradictions between global and national discourses of urban resilience planning and continuing patterns of destructive urban development. We look specifically at Kolkata and Mumbai, two of India’s largest and most flood-affected cities. We argue that resilience planning, promoted by the central government and international consultants, and presented in locally produced “fantasy plans,” fails to address the risks of flooding due to its tendency to sidestep questions of politics, power and the distributional conflicts that shape urban development. We conclude that analyses of governance and informality, and especially the politics of planned and unplanned development, should more directly inform studies of urban coastal flooding. The symposium follows a workshop convened by Gavin Shatkin and generously supported by Northeastern University in 2016, and a subsequent panel at AAG in 2017. I hope you will give the symposium a look. As always, if you don’t have access to these articles, just contact me and I can share soft copies. As planning educators, we believe it is our responsibility to help prospective students identify the graduate program that best fits their needs, goals, and interests. In light of this responsibility and after considerable deliberation, the full-time faculty of the Department of Urban and Regional Planning at the University of Colorado Denver have decided against participating in the 6th edition of the Planetizen Guide to Graduate Urban Planning Programs. We have several concerns with the Planetizen rankings that led us to our decision. First and foremost, we feel that our continued participation in the Planetizen process elevates a faulty premise – that PAB-accredited planning programs can, or should, be ranked against one another. Planning schools certainly have strengths and limitations that should be carefully weighed by prospective students, but the Planetizen rankings work to obscure these important differences by reducing multi-dimensional programs to a single score. In our experience, factors like the quality of a program’s curriculum, the skills it teaches, its location, student access to faculty, and the program’s connection to the local and regional planning community are the crucial factors that inform a student’s job-market success and career satisfaction, yet are all difficult to quantify and measure. We believe that ranking graduate planning schools – programs which already meet rigorous accreditation standards – discourages the kind of nuanced and critical assessment a prospective student must make to determine which program best suits them. Even if we did support the premise that program rankings are a valid or useful tool for prospective students, we have several additional concerns. Foremost among them is graduate school affordability. Our experience tells us that many students’ interests are better met by in-state or regional-serving institutions with lower tuition and costs, yet such programs tend to appear lower in the rankings. We believe this gives some prospective students the false impression that if they choose a lower-cost program they will receive a lesser education. A related concern is the cost of the Planetizen guide itself. To produce their guide, Planetizen relies on substantial effort by planning faculty and staff, which they then package and sell to prospective students at a premium. We are concerned about a private company using our limited resources for their own profit, and are particularly worried about the burden it places on smaller programs. Finally, we have concerns with the ranking methodology, which after a decade remains opaque and proprietary to Planetizen. As critics of the Planetizen guide and other ranking processes have noted, the self-reported data that impacts such rankings are vulnerable to manipulation. Further, using a faculty survey of program reputation would seem to intrinsically favor large, nationally-prominent universities with high-profile research faculty and PhD programs from which most planning faculty earned their degrees. These are excellent programs, but we believe the survey of program reputation disadvantages many smaller and more regional-serving institutions that also deliver an excellent graduate education. We believe there is value in having a comprehensive and informative guide to graduate urban and regional planning programs. We also believe that the Planetizen process has encouraged programs to more routinely collect comparable information that is useful for prospective students – a trend we support. In the near term we will continue sharing these and other key indicators about our program on our website. In the long term, we welcome the opportunity to collaborate with like-minded programs to help make comparisons as straightforward and transparent as possible by sharing common data and metrics. We are also committed to working with colleagues to produce a free guide to graduate planning programs, one that allows students to understand the many nuances that make our programs unique. I have just finished serving on my second faculty search committee this year, and so the job market is very much on my mind. Since becoming a tenure-track faculty in 2011, I have developed some standard advice that I give to incoming PhD students. The advice is based on my own experiences on the job market and on my participation in multiple faculty searches in urban and regional planning. This advice is nothing new or different, but I find it a useful set of goals that PhD students should aspire to over their time at CU to put themselves in a good position for the academic job market. Publish - The market today demands that candidates have published at least one article in a peer-reviewed journal, and probably two. You don’t need 10 publications, and you don’t need to have hundreds of citations. What matters most, in my experience, is that you have demonstrated that you can translate your research ideas and data into actual publications, which is perhaps the single most-important task you will be assigned as a junior faculty member. It is fine to publish with your advisor, but be careful if all of your publications are with them. A search committee might assume (rightly or wrongly) that you rode their coattails through the publication process. If you are collaborating mostly with faculty, be sure to describe your contribution clearly in your cover letter and work towards lead-authoring later in your student career. If possible, try and have at least one sole-authored article. This is more difficult in some subfields than others, but it is the best signal you can send to a search committee that you are ready to step into a tenure-track position (thanks to Dan Immergluck for this suggestion to my original post, which I agree with). Apply for external funding - Securing grant funding for your research is an important part of junior faculty life. During your time as a PhD student, you should demonstrate that you can successfully apply for grants, small and large. This is often a shortcoming for candidates coming from well-resourced programs, because they may never be forced to apply for competitive funding. You should apply for grants regardless of your funding. Doing so will show the search committee that you are willing to expose your ideas to external scrutiny, and that you know how the process for funding works. Try and follow the same path that many successful faculty do: start with small grants (internal travel grants, seed funds) which allow you to test your ideas and collect preliminary data before drafting larger and more ambitious proposals (to the NSF, Lincoln Land Institute, Fulbright, Eisenhower, etc). Avoid publications that don’t matter: Publishing is partly an ego game…at different times during your PhD program you may be seduced by “opportunities” to publish in venues that simply don’t matter. Avoid, like the plague, encyclopedia entries, chapters in edited volumes, student planning journals, and obscure journals with low standards. Run away. Keep your eyes and brain focused squarely on peer-reviewed articles in medium-to-high quality outlets, or securing that amazing book contract with a university press. The above advice might be controversial, but the worst outcome is that you give your precious time and ideas away for a publication that doesn’t ‘count’ in the eyes of the search committee. Better that you start as a 3rd or 4th author on a paper with your advisor or committee, learn the ropes, and then take your best shot at a quality journal. If you already have several good publications…great! Then you can confidently be part of that perfect edited volume. But don’t rely on that publication to get you an interview. Present at conferences: Publishing is a careful and iterative process. Journal articles don’t spring from your head and land directly in JAPA, at least not for most of us. More typically, the first step is to present your ideas and preliminary data at a good conference, get focused feedback, and then revise for another conference or submission to a journal. You should try and present at a conference at least once per year during your PhD, starting in your 2nd year. In our small field, you will get the added benefit of meeting your future colleagues, networking, understanding where you ‘fit’ in your subfield, and becoming more comfortable speaking in front of an audience, some of whom might terrify you. Use deadlines: All of the above goals involve deadlines - for abstracts, grant proposals, conference papers, manuscripts, revisions, etc. Use these deadlines to your advantage, and let them structure your research time. Like it or not, many of us operate as procrastinators - we need external prompts and signals to get down to work. Using a revolving set of deadlines is a great way to remain consistently productive. Teach: You should teach, even if you aren’t required to for your funding. Again, start small. TA for a great faculty member. Ask to teach an individual lecture or lead a discussion. Later, look for opportunities to develop your own syllabus and deliver a class on your own. Take advantage of your university’s resources on teaching and learning. The old advice that “teaching doesn’t matter” does not hold true anymore, at least for programs like ours (professional Masters program at an R1 university). We take teaching very seriously and probably won’t interview a candidate that has no track record in the classroom. Be of service: You should do some high-quality service while you are a PhD student. This comes in many forms, up-to-and-including serving as a representative to the ACSP or on a national-level committee. But local stuff really counts. Serve as an officer in your PhD student group. Help organize a lecture or contribute to a conference. Write a book review for a quality journal. These are all evidence that you are a good colleague willing to pitch-in, and aren’t squarely focused on your own achievements and stature. Under no circumstances should you be seduced (see above) by the “opportunity” to do service that overwhelms everything else. Don’t organize a year-long seminar series or conference event on your campus, unless it is necessary for your funding. Don’t join the board of a non-profit if it takes you away from your teaching and writing. You have only limited time as a PhD student, and you need to do all of the above to succeed. A huge record of service but no publications or teaching will probably sink you with most searches. This is a daunting set of goals, especially when you are also expected to take classes, read, think, and have a life outside of your program. But if you start immediately with the small stuff you should be hitting your stride by your later years. Eat that elephant one bite at a time. Not surprisingly, this list mirrors almost exactly what you will need to do as a junior faculty member to receive tenure (have a robust research record, teach well, be of service), so it is no surprise that it is a good set of criteria for candidates who want to someday be junior faculty. Ultimately there is a lot more to the job market than the above. At a certain point in the process, search committees are forced to choose among a whole range of great candidates, and the elusive ‘fit’ becomes important. But work towards the above goals while you are in graduate school and you should well-positioned to make the first cut in a lot of job searches. There is a stunning lack of research on mobile home parks, generally and specific to disasters. Mobile home parks house nearly 3 million households in the United States, in all sizes and shapes of communities. They are a vital source of affordable housing in many places, especially California, Texas and Florida. I’m sure we have all heard the jokes about mobile home parks and tornados. Toby Keith affectionately sings about the stereotypes in the song Trailerhood, for example. Disaster researchers do know a little bit: we know that mobile homes, especially pre- “HUD code” homes (built before 1976) are especially vulnerable to natural hazards like fire and high winds. But this is only one dimension of vulnerability. Many of the unique aspects of mobile home parks and their relationship to disaster risk remain unexplored. Mobile home parks can be fantastically affordable, especially in the context of the growing affordability crisis in many parts of the country. Mobile home parks tend to spatially concentrate socially vulnerable households. Mobile home parks tend to be in more hazardous areas (like floodplains) relative to site-built housing, for different historical reasons. Mobile home parks are stigmatized in popular culture and even the affordable housing world, and tend to get stigmatized in local plans and regulations - what Esther Sullivan identifies and terms “socio-spatial stimgatization” in her new book. This has all kinds of important implications for disaster risk, including presenting major barriers to recovery. Mobile home parks have unique tenure arrangements, where residents often own their housing unit but rent the land underneath. Again, this has all kinds of important effects on disaster vulnerability, from lack of insurance to exclusion from community engagement processes. Lots more to say, and I will share our article when (fingers crossed!) it gets published. In the meantime, the NSF has given us the resources to do a large-scale study of mobile home parks and Hurricane Harvey in the Houston metropolitan area. You can read a few of our preliminary findings here. Gretel Follingstad (PhD candidate, University of Colorado Denver) and I have a new article in the International Journal of Disaster Risk Reduction entitled “Urban disasters beyond the city: Environmental risk in India’s fast-growing towns and villages.” We studied 5 fast-growing towns and villages in the mountains of West Bengal, India with some pretty eye-opening findings. The mountains of West Bengal are exposed to numerous hazards, most importantly landslides and earthquakes. We used Birkmann et al. 's MOVE framework to study household and community risk to these hazards. Numerous factors contributing to disaster risk, most importantly the expansion of the built environment into hazardous areas. In places still governed as rural we found that the number of buildings and paved roadways has increased by 40-80% in the past decade alone. The economy has also shifted, away from agriculture and towards tourism, an industry highly vulnerable to acute "shocks," especially from a major disaster. Lastly, towns and villages are still governed by rural institutions which are largely unequipped to manage urbanization. There is little-to-no regulation of building and development, or coordinated efforts at hazard mitigation. While urbanization has brought many short-term benefits and increased resilience in some ways, disaster risk is being created and is accumulating in the built environment, and will someday be "released" by a major disaster event. While this is a small-N study, we expect to find similar trends and dynamics in fast-growing villages and towns elsewhere in India. This "hidden urbanization" is a force that is virtually absent from the hazard/disaster research literature. Please see the abstract of the article below. The full article is available here. If you do not have access to IJDRR, please contact me and I can provide you with a copy. India is one of the fastest urbanizing countries in the world. Although urban scholars tend to focus on India’s large cities, urbanization is also transforming its villages and towns. In this paper we ask how urbanization is shaping environmental risk in five fast-growing towns and villages in the Darjeeling District, a mountainous region in the state of West Bengal. We base our study on the MOVE Framework, a comprehensive and integrative framework for assessing disaster and climate risk. Drawing on primary and secondary data collected over a 3-year period 2015–2017, we find that urbanizing towns and villages are characterized by rapid spatial growth, dynamic and challenging hazard contexts, and limitations in governance capacity or resources to document, govern, or adapt to emerging environmental threats. The risk that is accumulating in the built environment and economy may only be “revealed” after a major disaster, however. These characteristics and trends are likely common in other small urbanizing places and must be managed to achieve national and international goals for sustainable and resilient development. Damaged mobile homes in Evans, Colorado. Image: The Greeley Tribune. I will be speaking at the University of Utah on February 21st, 2019 on “Disasters and Uneven Recovery: Lessons from the 2013 Colorado Floods.” My lecture will report findings from an 18-month study of mobile home parks in Colorado that were impacted by the disaster, and the struggle of residents to return to their communities and rebuild. The lecture is part of the Year of Resilience Event Series, hosted by the Department of City & Metropolitan Planning and the Global Change and Sustainability Center at the University of Utah. For information on the time and location, and to learn about other resilience events at the U, visit their webpage.